Our Executive Express Conferencing helps you communicate quickly, efficiently and cost-effectively as a group without making elaborate arrangements or traveling. Maintain reliable toll-free and toll access worldwide for critical meetings. Start a global conference call without any prior reservations or time of day restrictions. Give guests local toll numbers in 15+ countries, or get your own custom access number for guests to dial into. Record with touchtone commands, and let others listen later with telephone playback. 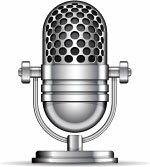 Through your online account administration, you may download past recordings in either .mp3 or .wav formats. All guests can also listen to your recorded conference at anytime through optional telephone playback. 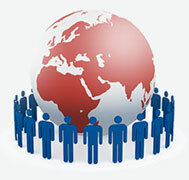 Access conferences calls worldwide with Global "800" numbers, local numbers, and more. 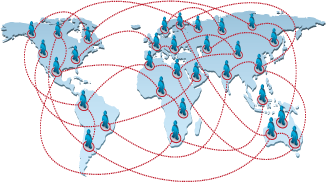 Have our automated system make an outbound call to your participants in any country, and instantly bring them into your conference call. 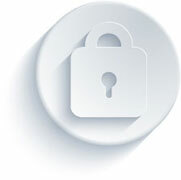 Enhance call security with chairperson passcodes, or you can also require additional passcodes. You will always have an instant view to who is on your conference call at all times. Optionally send out invitations and integrate the replies into calendars. View complete details on conference calls, manage account users, conference codes, and more. 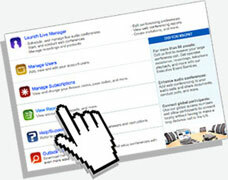 Use our Live Conference Manager to gain access to many of the features that are also available via touch-tone commands. Get a visual overview of everything happening in your conference with all the tools at your fingertips. Streamline billing through one invoice for all accounts, and with no contracts or hidden fees. 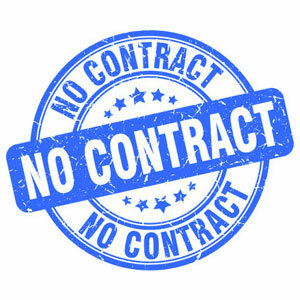 Avoid long term contracts from expensive large telecom carriers, and experience Tier 1 global audio conferencing at a fraction of the cost. Save over 90% over traditional conference providers. North America Toll-Free & Toll 4.9¢ Per minute, per person. Covers USA, Hawaii, Alaska, and Canada. 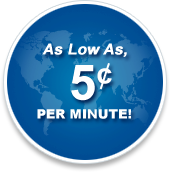 North America Dial Out 4.9¢ Per minute, per person. Covers USA, Hawaii, Alaska, and Canada. Executive Web Meeting 8.9¢ Per minute, per person. Executive eMeeting - Webex 25¢ Per minute, per person. Executive Live Meeting - Microsoft 25¢ Per minute, per person. Executive Live Meeting (Unlimited) $250 Per year, per seat. Charges consist of a setup fee plus an extra line charge. Recordings may be downloaded and deleted from server that same day to avoid any hosting fees. File formats are MP3 (.mp3) for Audio conferences, and Macromedia Flash (.fla) for Audio + Web. 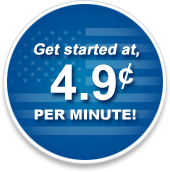 - Extra line charge 1.6¢ Extra line in conference at USA, per minute, per line rate. The first 256 playbacks are included with the recording hosting fee. - Additional Playbacks $24.00 Per additional bundle of 256 playbacks. Unused playbacks do not carry over month-to-month.